Last week I wrote about miracles. It’s funny, but I had no idea that I would be speaking to a pastor who had some of his own miracles to share. Interested in re-telling Vineyard’s story about how Screenflex has helped their church, I called Vineyard Christian Church of Crystal Lake and spoke to Tim Mengler. Tim shared his experiences using Screenflex as well as an incredible miracle involving his son. Around 5 years ago, Tim and his family planted a church in Crystal Lake. 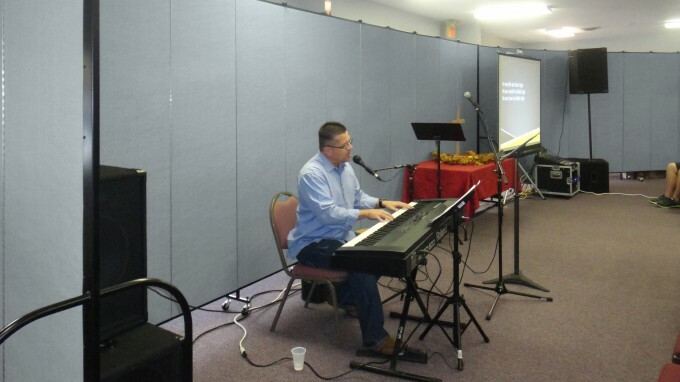 Tim started holding services in his home for about a year and as his church started to grow, they moved to a conference center where they worshiped for 3 years. 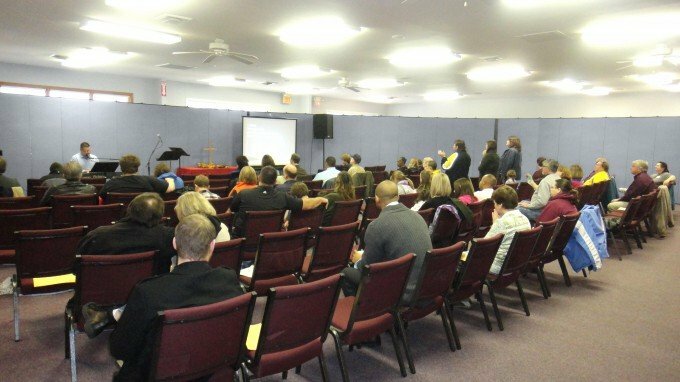 Just this past October, the congregation moved their services to their own church building (7105 South Virginia Road Ste 18) in Crystal Lake where in six months they have doubled in size. What Tim wanted to create for Vineyard, was a backdrop to cover windows that overlooked a parking lot and at the same time keep in as much natural light in the room as possible. He also wanted an area or walkway where church members could enter and not cause distractions during the sermon (See the picture below). Tim did not want to build any permanent walls mainly because they were leasing the building and they knew that permanent walls would obstruct the natural light coming into the room. Tim purchased 3 dividers (Two 24’L x 7’4″H and one 16’9″ L x 7’4″ H). We had three goals with the use of our Screenflex wall system. First was to partially block but not eliminate the natural light coming in from the large windows at the front of the space. Second, was to create a more intimate space out of a large area and third was to create traffic flow around the space. They accomplished exactly that and we couldn’t be more pleased with how they have worked out. I didn’t forget about the miracle. When Tim’s son was around 18 months old, the doctor told the Mengler family that their baby had a defective heart valve and a hole in his heart. The doctor suggested an echocardiogram in 3 months and possible surgery. Tim and his family prayed for healing and when they returned to the doctor 3 months later the heart valve was healed and hole closed. Tim’s son is now 17 years old and a happy and healthy teenager. Tim said that the healing was a miracle and he devotes his life to God because miracles are the foundation of the Vineyard faith.